Freedom of speech and freedom of expression are the foundation of our democracy, without which all of our other freedoms and liberties are mute. Ontario doctors must be protected from the muzzling and silencing attempts by the Ontario Medical Association (OMA). Doctors' freedom of speech ensures the protection of patients through advocacy against harmful government actions and legislation. In 2018, Ontario already has one million patients without a family doctor, unprecedented emergency room gridlocks with stretchers with seniors endlessly lining hallway corridors, closure of operating rooms, cancellation of essential surgeries and wait times to see some specialists skyrocketing to more than three years. This has been the result of approximately $5 Billion in cuts to the frontline patient care that doctors provide since 2015 alone. These reckless cuts had unilaterally been undertaken by the Ontario Liberal government and still continue today under the Ontario PC government averaging approximately $100 Million in frontline cuts each month as doctors soon enter their sixth year without a contract and eight consecutive year of deep cuts to frontline patient care: unprecedented in the history of Canada's healthcare. The government has rationed your healthcare while expanding wasteful healthcare bureaucracy. The OMA has passively stood by as the government has passed healthcare policies that hurt patients. The OMA is beholden to the government as it is the only medical association in Canada that is guaranteed $54 Million annually in mandatory dues from Ontario's doctors due to government legislation passed in 1991. The OMA has refused to be accountable and transparent to its mandatory members and blocked all efforts to achieve financial transparency on these millions in dues. As doctors' calls grow louder for a fully independent forensic review of the OMA, the OMA has undertaken sweeping undemocratic by-law changes stripping doctors of any real voice in their own organization. The OMA is now set to silence doctors' voices to protect its own bureaucratic and financial interests. Ontario's patients and doctors deserve better. 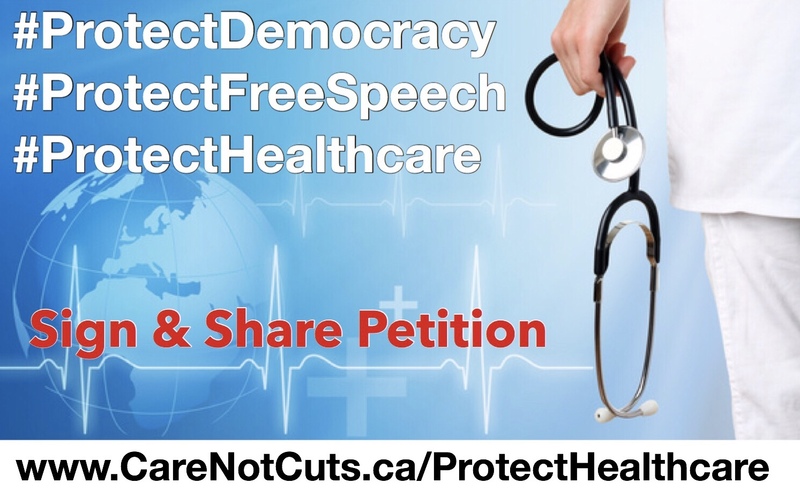 Please help to be the voice of change in Ontario's healthcare system and click below to sign the petition to protect democracy, to protect free speech and to protect your and your family's healthcare - to protect the healthcare of Ontario's 14 million patients. Concerned Ontario Doctors (COD) held a Press Conference at Queen’s Park on December 4, 2018 to speak out about the worsening healthcare crisis with insights from the frontlines since the provincial election. Ontario's Doctors will soon enter their unprecedented sixth year without a contract and eighth consecutive year of deep cuts to the essential frontline patient care they provide to 14 Million Ontarians. Wynne’s Liberal government had unilaterally cut approximately $5 Billion from the frontline patient care your doctors provide since January 2015 alone. They had implemented reckless programs targeting new family medicine graduates and community specialists. These reckless and unilateral frontline cuts and senseless healthcare policies are still ongoing today under Ford’s PC government with approximately $100 Million in ongoing monthly, unilateral cuts from the frontline patient care MDs provide. Ford’s government continues to empower healthcare bureaucrats at the detriment of frontline patient care. They are revamping the healthcare system and changing the way all physicians in Ontario practice -- all without any frontline input. Throughout the election campaign, Premier Doug Ford had promised to engage and listen to frontline doctors, and slash wasteful healthcare bureaucracy. Now the exact opposite is happening. Ford’s PC government has broken its election promises to Ontario voters. Family doctors are having to close their doors. Specialists and surgeons are leaving the province. Graduating residents are being forced to start their practices elsewhere. Ontario's physicians are now forced to ration essential care for their patients. Healthcare policies are being dictated by government bureaucrats with no medical training or expertise. We are on your side and we are telling you that the Ontario Government is dismantling healthcare piece by piece. We are your Concerned Ontario Doctors, and we are standing up and fighting to save our healthcare system. We need to bring Canadian values back to Ontario. Please add your voice to ours to tell the Ontario Government what healthcare should look like! Let's fight for our healthcare together! ~60,000 Canadians have signed the petition to #ProtectSmallBiz and #StopMDExodus. Please add your name and share today! On October 25, 2017, Dr. Kulvinder Gill, President of Concerned Ontarios Doctors (COD), testified at the Senate of Canada - Sénat du Canada's Standing Committee on National Finance in Ottawa about the detrimental impact the proposed federal taxation changes will have on the future of Canada's healthcare. Please share and help us inform fellow Canadians. Toronto, ON (April 24, 2019) — Last week, the Ontario Minister of Health, Christine Elliott, announced the Ford government’s plan to expand the scope of practice for pharmacists in Ontario. There has been much misinformation advanced by Ford’s government which raises serious concerns regarding patient safety in the face of heavy lobbying efforts by the pharmaceutical industry in recent months. It is crucial for policy makers and the public to understand: 1) the training and expertise of doctors; 2) that good patient outcomes stem from an accurate diagnosis based on doctors’ extensive training; 3) the dangerous threat of antibiotic resistance; 4) the dangers of conflicts of interests in healthcare to patient safety; 5) the false government narratives ignoring patient outcomes; 6) the Ontario government’s doublespeak to protect its vested interests; 7) the Ontario government is failing to fund, train, retain and recruit an adequate supply of physicians; 8) the aggressive pharmacist lobbying and pharmacist fraud; 9) concerns about invasion of your private medical records; 10) the pharmaceutical industry’s cozy relation with the Ontario government; and 11) the Ontario government prioritizing corporate interests above patient safety. Toronto, ON (February 25, 2019) - After five long years without a contract and seven consecutive years of deep, unilateral cuts to frontline patient care, Ontario’s doctors were eager to read the Arbitration Report arising from proceedings between the Ontario Ministry of Health and Long-Term Care (MOHLTC) and the Ontario Medical Association (OMA) released on February 19, 2019. To truly address Ontario’s healthcare crisis and ensure that patients receive access to quality and timely care, it is crucial to address the Ontario Medical Association’s (OMA) profound lack of accountability and financial transparency to frontline physicians. Toronto, ON (October 10, 2018) - On October 6, 2018, the Canadian Medical Association (CMA) abruptly left the World Medical Association (WMA) Meeting being held in Iceland and resigned from the WMA. In 1946, Canada was one of only ten counties to establish an Organizing Committee of international medical doctors. This Organizing Committee, that was Chaired by Ontario physician Dr. T. Clarence Routley, then founded the World Medical Association in 1947 with 29 countries. The World Medical Association developed the modernized Hippocratic Oath with the Declaration of Geneva in 1948 after the World War II atrocities and has since had the highest standard of International Code of Medical Ethics. Now in 2018, the WMA includes 114 countries and represents more than 10-Million physicians globally. Just days ago, the CMA abruptly resigned Canada from the WMA following absolutely no consultation with Canada’s physicians. The CMA is claiming that their sudden resignation from the WMA is about an “ethical” stand on “plagiarism”. But there is far more to this than meets the eye and this will impact all Canadians (click here for more information). Toronto, ON (July 8, 2018) – The Ontario Liberals have been defeated and reduced to non-party status, and the Kathleen Wynne government’s role in creating the worst healthcare crisis in our province’s history played a large part in their defeat. However, an elephant in the room remains to be addressed — the Ontario Medical Association (OMA). Toronto, ON (June 8, 2018) – On behalf of frontline family doctors and specialists throughout our province, Concerned Ontario Doctors (COD) congratulates the incoming Premier of Ontario Doug Ford and the Ontario PC Party for forming a decisive majority government. Ontario’s frontline physicians look forward to working with the new government to finally begin to address our healthcare crisis. Toronto, ON (June 2, 2018) – This morning Premier Kathleen Wynne finally conceded and admitted that she will lose the upcoming provincial election. She made the announcement during a press conference just two hours prior to a Public Rally that had been scheduled and organized by Concerned Ontario Doctors (COD) outside of her campaign office. Toronto, ON (May 21, 2018) - Just weeks remain until Ontario’s provincial election when patients can vote in a new government that is willing to engage with frontline doctors and nurses to address the worst healthcare crisis in Ontario’s history. It’s a crisis created by years of neglect, mismanagement and deep frontline cuts by Premier Kathleen Wynne and the Ontario Liberal government. Toronto, ON (March 23, 2018)— There is no doubt an election is upon us. In desperation, Premier Kathleen Wynne has already begun campaigning. It started this week as she unveiled her election platform in her Throne Speech. Every day since, she has staged announcements to feign her “commitment” to healthcare, now throwing “millions” at hospitals. Toronto, ON (March 8, 2018) – As Ontario’s physicians soon enter their fifth year without a contract with the Ontario Liberal government, healthcare provision in the province remains a grossly underfunded and disorganized disaster. The surge of influenza cases has shut down hospital wards and overwhelmed emergency departments across Ontario. Some hospitals in the GTA have cancelled elective surgeries due to the shortage of beds available for post-operative patients. Years of billions of dollars in unilateral cuts to frontline patient care have left nearly one million Ontarians without a family doctor and some specialist wait times exploding to over three years. Ontario’s healthcare is in crisis. Toronto, ON (February 11, 2018) - “I disapprove of what you say, but will defend to the death your right to say it” is a foundational principle of democracy. In November, the Ontario Medical Association (OMA) drafted a Code of Conduct Policy for its members that threatens to stymie criticism from doctors. None of the other provincial/territorial associations have such a policy. Toronto, ON (December 5, 2017) - Ontario’s doctors were recently surveyed for their views of the Ontario Medical Association by Concerned Ontario Doctors, an independent, grass-roots organization. Over 5,000 responded. 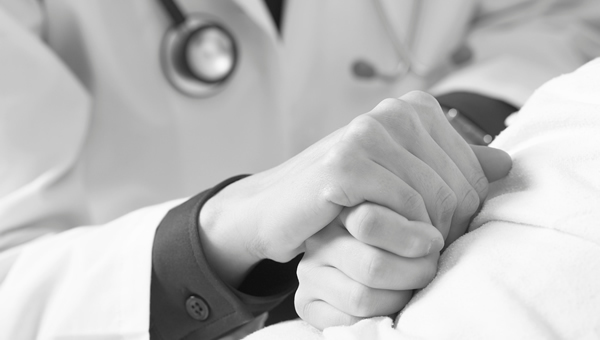 Seventy-six percent said they don’t trust the OMA, the doctors’ official representative body. Toronto, ON (November 24, 2017) - An online survey of Ontario’s doctors was conducted by Concerned Ontario Doctors from September 4 to September 11, 2017 to understand physicians’ views about the Ontario Medical Association (OMA). 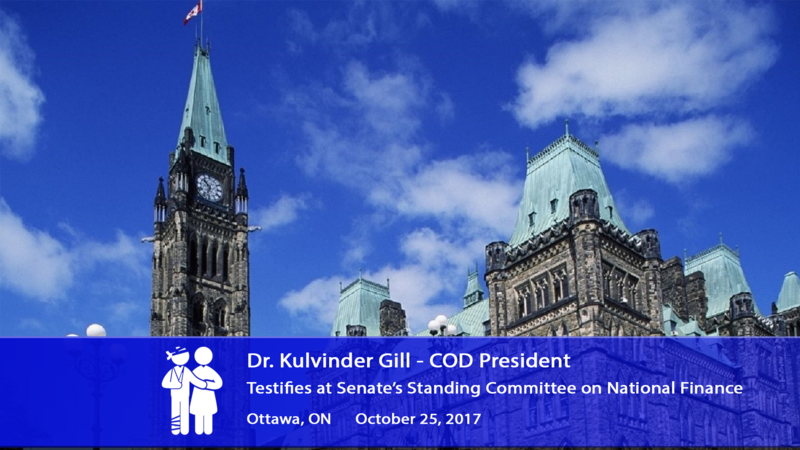 Toronto, ON (October 30, 2017) - On October 25, 2017, Dr. Kulvinder Gill, President of Concerned Ontario Doctors (COD), testified at the Senate of Canada’s Standing Committee on National Finance in Ottawa as part of the Health Sector Panel. Dr. Gill had shared concerns about the detrimental impact the proposed federal taxation changes will have on the future of Canada's healthcare (video of testimony). Toronto, ON (September 27, 2017) – An online survey of Ontario’s doctors and medical trainees (medical students and medical residents) was conducted by Concerned Ontario Doctors from September 4 to September 11, 2017 to understand the effects of the provincial unilateral healthcare cuts, proposed federal taxation changes and mistreatment by government. Respondents were also asked about the OMA; those results will be released independently next month. Toronto, ON (September 7, 2017) – The Trudeau government’s proposed corporation tax changes are one of the most divisive, disastrous and frightening issues to face our nation in decades. Yesterday, Barb Shellian, the President of the Canadian Nurses Association (CNA)—representing nearly 139,000 registered nurses in Canada, issued a statement on behalf of its members, supporting the proposed taxation changes. Toronto, ON (April 11, 2017)— Ontario doctors have now entered into their fourth year without a contract – unprecedented in Canada. Since 2015, the Ontario Liberal government has unilaterally cut over $2.5 Billion from the patient services physicians provide leading to ever growing specialist wait times, OR closures, ER gridlocks and one million patients in the province without a family doctor. To individual Ontario physicians, the stark reality is they struggle to make ends meet with funding that is 55% less than recommended by the OMA today. Furthermore, despite being an essential service, this government has denied physicians the right to binding arbitration and have instead created a toxic environment. Toronto, ON (March 20, 2017) -- March 7th 2017 will be a day remembered for a seismic change that rolled across Ontario medical politics. For the first time, an organized campaign led to the election of a large contingent of passionate, frontline physicians to many positions on the Ontario Medical Association (OMA) Council. Toronto, ON (February 7, 2017) - Concerned Ontario Doctors (COD) and the Coalition of Ontario Doctors called yesterday’s partial resignation of the Ontario Medical Association (OMA) Executive members a positive first step in the rehabilitation of the OMA’s governance structure and its duty to represent all Ontario doctors fairly. The resignation is partial because the same individuals remain on the OMA Board for the time being leaving many unanswered questions. ONTARIO MEDICAL ASSOCIATION KNOWINGLY MISLEADS DOCTORS AND PUBLIC ABOUT LEADERSHIP CRISIS - Toronto, ON (January 30, 2017) - For the first time in the Ontario Medical Association's (OMA) history, Council has passed a resolution declaring it has lost confidence in the OMA Executive Committee by a 55% vote. Despite that, an OMA communication released immediately after the meeting knowingly lied about Council members who had expressed a clear non-confidence motion against the Executive. In the opening sentence of the OMA news release it shockingly stated, “doctors in Ontario affirmed their confidence in the elected leaders of the OMA”. Toronto, ON (January 9, 2017) - With the passage of Bill 41, the "Patients First Act", into law on December 8, 2016, the Ontario Liberal government is embarking on a path to radically alter the way healthcare is delivered in Ontario. At a time when public support and confidence in the Wynne government is at an all time low due to the mismanagement of public services including Hydro and eHealth, there will be a ballooning of healthcare bureaucracy, further diverting millions more from frontline patient care in a healthcare system already underfunded and mismanaged. LIBERAL HEALTH MINISTER HOSKINS MUST RESIGN TO PROTECT PATIENTS - Toronto, ON (December 15, 2016) - The Coalition of Ontario Doctors concluded a meeting last night calling for the immediate resignation of Health Minister Eric Hoskins arising from his latest attempt to misdirect blame for his mismanagement of the health care system and his continuing efforts to marginalise practising physicians and their medical leaders, including the Ontario Medical Association (OMA). Ottawa, ON (November 16, 2016) – Over the past several weeks, Ontario’s patients and doctors have come together to highlight the devastating impacts of the Ontario Liberal government’s short-sighted healthcare cuts. Concerned Ontario Doctors held public rallies in STONEY CREEK (click for video) on November 5 and OTTAWA (click for video) on November 6 to highlight the growing healthcare crisis that has stricken the province and for the residents of the Niagara Region and Ottawa-Vanier to see past the political spin to understand exactly what these cuts mean to their and their family’s care. Toronto, ON (October 14, 2016) — It would appear that the Ontario Liberals are finally starting to realize that their strategy of “cutting funds first, asking questions later” is simply not working. In October 2015, the Ontario Liberals introduced drastic cuts to OHIP funding for opioid addiction treatment. These cuts were made with under one month’s notice and have resulted in multiple addiction clinic closures and reduced hours of access -- all in the midst of the worst opioid overdose epidemic the province has ever seen. Toronto, ON (October 6, 2016) — Today, the Ontario Liberal government is set to continue what may be its most destructive, scandal-in-waiting odyssey yet: the introduction of Bill 41. With the previous passage of Bill 119 (the Health Information Protection Act) in May, the Ministry of Health and Long-Term Care (MOHLTC) can now access any Ontario patient’s private medical record. Never before has a provincial government been able to do to this and even physicians are unclear as to why bureaucrats would require such far-reaching access. Long considered a patient's private and personal domain, a medical record is now accessible, under law, by government appointed bureaucrats – and without a patient’s consent. Scarborough, ON (September 6, 2016) – On September 1, 2016, Scarborough-Rouge River voters sent a clear message to the Ontario Liberals: make healthcare a provincial priority. In a historic by-election, the Progressive Conservative candidate, Raymond Cho, was elected in a riding that has been held by Liberal MPPs since its inception in 1999. Prior to that, the area had been in the Scarborough North riding and held by Liberal MPP Alvin Curling since 1985. Breaking through a Liberal stronghold dating back decades is indicative of just how upset Ontarians are with Kathleen Wynne’s handling of healthcare and hydro, the two key voter concerns during this by-election. Toronto, ON (July 21, 2016) - The announcement of the tentative contract between the Ontario Medical Association (OMA) and the Ministry of Health (MOH) on July 11 was met with widespread shock. In the past week and a half, thousands of physicians across Ontario have spoken out about the many flaws in the contract -- flaws that will undermine patient care. For this reason, the Coalition of Ontario Doctors held a Queen's Park press conference to reveal the back-room deals that brokered a misleading doctor deal. This Coalition represents over 19,000 family doctors and specialists from Concerned Ontario Doctors, Doctors Ontario and nine OMA sections (including medical, surgical and diagnostic specialties). Thousands of doctors across Ontario are calling for a public inquiry into the negotiations process between the OMA and the MOH. Toronto, ON (July 25, 2016) - Approximately 300 supporters braved the heat and humidity to stand in solidarity with Concerned Ontario Doctors on July 22 and protest a new tentative physicians' contract that undermines patient care. The rally began with speeches by patients and doctors at the Ministry of Health offices on Grosvenor Street. Then accompanied by Toronto Police and cheerful honks, the protestors marched, cheering "No way to the PSA!" and "Put Patients First!" all the way to the Bloor Street offices of the Ontario Medical Association (OMA). Toronto, ON (July 12, 2016) - Thousands of physicians were shocked to read in the newspapers yesterday that their representative organization, the Ontario Medical Association (OMA), had reached a tentative agreement with the Ministry of Health. Front-line physicians had no inkling that negotiations were even taking place. Physicians were angry to hear about the proposed contract from the media rather than the OMA and before even having the opportunity to study the details of this tentative agreement. Toronto, ON (June 13, 2016) - The Ontario Liberals are determined to revamp the healthcare system as we know it. In the past six months, they have introduced two bills, Bill 119 and Bill 210, that will fundamentally affect the way healthcare is delivered on the frontlines. While some of their ideas sound great on the surface, many more are troubling because they intrude on personal privacy and they value bureaucracy over patient care. Toronto, ON - Question Period on Monday, May 30 was marked by a determined, almost frenetic focus on Ontario's healthcare system. With only two weeks to go until Queen's Park breaks for the Summer (and, rumour has it, hibernates through the Fall) every single member of the Official Opposition -- even if it wasn't their usual Ministerial responsibility –- stood and questioned the Liberal government on their mishandling of the healthcare portfolio. This dramatic show of unity was witnessed by members of Concerned Ontario Doctors, a grassroots physician advocacy group that has advocated loudly against Liberal healthcare cuts. Toronto, ON (May 25, 2016) – Last week, Ontario's Financial Accountability Office evaluated the province’s fiscal outlook. In terms of Ontario’s healthcare system, the FAO report independently confirmed what Concerned Ontario Doctors have said all along: in contrast to promises made via expensive radio and print ads, the Ontario Liberals have short-changed healthcare for the past four years by an ever-increasing margin. This disparity reached an all-time high in 2015. All things considered, healthcare needs in Ontario grew by 5.2% in 2015; the Ontario Liberals’ so-called investment was 1.5%, not even a third of what was necessary to maintain standard of care in Ontario's healthcare system. Toronto, ON (May 12, 2016) - In the interest of sticking to a budget that completely underestimates patient need, Health Minister Eric Hoskins has imposed a questionable and unsafe contract upon physicians. He has vilified physicians in the media. He has initiated programs that have left new graduates unable to start a practice in their home-towns. He has instated fee cuts that have left physicians struggling to properly fund necessary medical equipment, staff and community-based offices. The inevitable result of thoughtless actions like these has been a rising tide of patient service reductions, staff lay-offs, unplanned physician retirements, physician relocations, hopeless physician morale, and escalating clinic closures across Ontario. CONCERNED ONTARIO DOCTORS HOLD QUEEN'S PARK RALLY TO DEMAND "PATIENTS BEFORE POLITICS"
Toronto, ON (April 20, 2016) - On Saturday, April 23 from noon to 3pm, Concerned Ontario Doctors are gathering on the South Lawn of Queen's Park to demand accountability and collaboration from the Ontario Liberals. This rally is open to all healthcare stakeholders, especially patients and the public. In fact, supporters are being bused in from each corner of the province, from Ottawa and Kingston to Midland and Cambridge, with hundreds planning to stand shoulder to shoulder with their doctors. Toronto, ON (February 29, 2016)– Concerned Ontario Doctors watched with great anticipation to see what the focus of this year's provincial budget will be. To great disappointment, much of the budget was smoke and mirrors, of promises and programs that seemed attractive on the surface, a facade that, like a cheap trinket, cracked under closer scrutiny. Toronto, ON (February 17, 2016) - On December 17, 2015, the Ontario Liberals released Patients First, a new plan to revamp healthcare delivery across all of Ontario. They claim it will streamline healthcare delivery and improve access to primary care. Their strategy is founded on reorganizing healthcare at the level of the family doctor, adding in more bureaucrats for up to 80 sub-LHINs and no actual increase in front-line healthcare workers. GET INFORMED. SPREAD THE WORD. TAKE ACTION.